Together with my regular fellwalking companion Graham, I'm ascending the Brund Gill path from Thirlspot. This is the view north towards St John's Vale and Skiddaw. 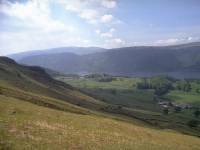 From high in Brund Gill, adjacent to Brown Crag, we got this superb view across Thirlmere. 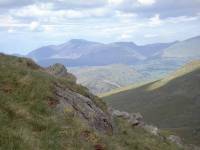 The Eel Crag/Grasmoor group is seen in the distance. 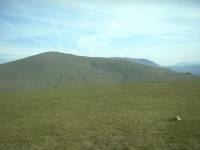 A couple of hundred feet higher, and Brund Gill closes in the view of Skiddaw to the northwest. England's 3rd highest mountain, Helvellyn (3118ft) seen from White Side (2832ft), its neighbour to the north and our first summit of the day. 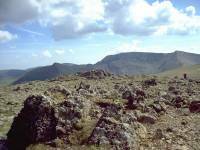 Helvellyn Low Man is to the far right, while Swirral Edge is seen to the left. 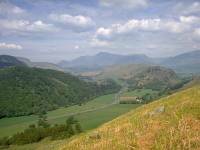 A view to the northwest, pretty much in the direction from which we've ascended the fell. 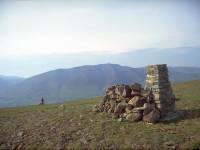 Skiddaw is the prominent mountain right of centre, Bassenthwaite lake can be seen to its left. 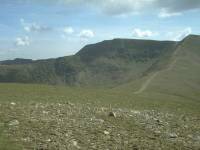 Raise (2889ft), is the next summit to the north in the Helvellyn group. 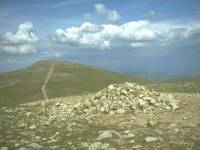 Raise is England's 13th highest summit; from here it's a simple walk of about 1km, and involves only 250ft of reascent. To the east a series of lateral ridges falls to the shore of Ullswater; one of these forms the satellite fells of Sheffield Pike and Glenridding Dodd. 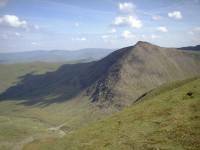 Catstycam (2917ft, England's 11th highest summit) seen from White Side (the 17th highest). 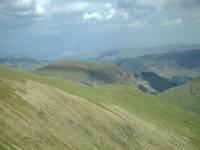 The ridge of Helvellyn, two miles to the south, overtops White Side, just half a mile away. 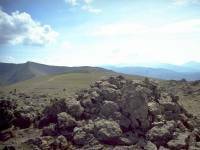 The rocky summit of Raise, with Catstycam and Helvellyn seen prominently to the south. Looking northwest from Raise across Sticks Pass to Stybarrow Dodd, the next fell on our walk northwards. (I know it's slightly askew. Just turn your head a bit). 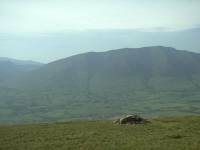 Having walked northwards from Sticks Pass over the Dodds, we've reached Clough Head (2381ft), the end of the ridge, at about 6.30pm. 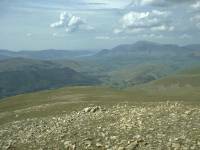 This is the view northwards to Blencathra. Looking back the way we came. 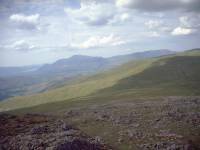 The complex of ridges that make up the southern wall of Blencathra are well seen from Clough Head. Graham studies the view across St John's Vale towards Keswick. 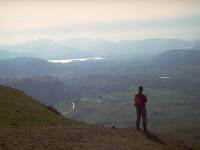 Derwentwater is seen just left of centre.